A senior woman in wheechair sitting at the table at home, talking to somebody. Woman sitting in wheelchair prays for healing and worships with her hands and arms raised into the air at the beach. Happy senior couple with wheelchair and tablet sitting at the table at home, talking. Slow motion. 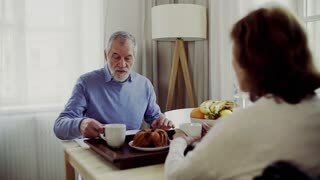 A senior couple with wheelchair sitting at the table at home, having breakfast and talking. Slow motion. 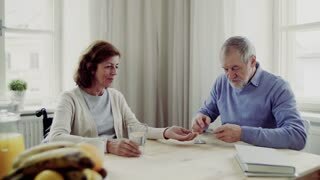 A senior couple with wheelchair sitting at the table at home, taking drugs and pills. A senior couple with wheelchair sitting at the table at home, having breakfast. A senior couple with wheelchair sitting at the table at home, having breakfast and talking. Senior Man In A Wheelchair Water His Flower, Which Stands On The Window Seal. Peaceful Man In An Armchair Enjoys The Sunny Day Watering His Flower And Smiles. Lonely Senior Man In A Wheel Chair Is Sitting At The Window Looking Outside. Sad Disabled Patient In An Armchair Looks Outside While Sitting At The Window. Beautiful Nurse In White Coat Types On The Laptop While Disabled Patient In A Wheel Chair Looks At The Screen. 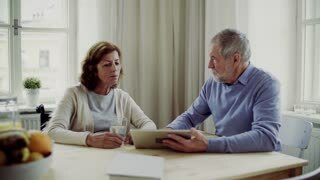 Curious Disabled Man In An Armchair Looks At How Doctor Types On Her Laptop. Smiling Man In Casual Cloth In An Armchair Types On His Laptop. Happy Senior Man In A Wheel Chair Show An Ok Sign While Working At The Laptop. Big Thumb Up. Middle-Ages Man In Casual Cloth Is Sitting In A Wheel Chair Typing On His Laptop. An Invalid In An Armchair Works At Computer From Home. Freelance. Top View. Disability. Doctor Moves A Wheelchair With A Patient. Legs Of A Disabled Person On An Armchair As Nurse Drives Him. Selective Shot. Close-Up Of Doctors And Disabled Persons Legs As Doctor Moving The Wheelchair.